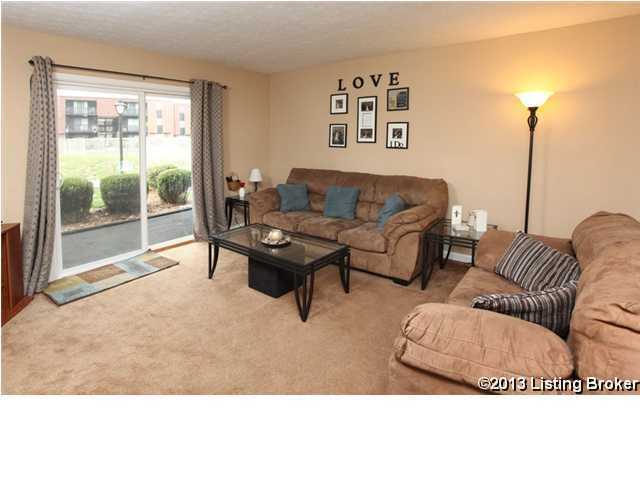 NEW *LOW* PRICE**FHA Approved**Completely UPDATED first floor unit with COURTYARD VIEW! Since owner purchased this condo, the following UPDATES have been made: CARPET replaced, fresh PAINT throughout, KITCHEN updated including CABINETS, counters, flooring, fixtures & APPLIANCES (about a year old AND THEY REMAIN!!! ), BATH UPDATED with vanity, lighting, flooring, toilet, and tub, WATER HEATER replaced, and doors have been replaced. Stackable washer & dryer in-unit LAUNDRY remains! You simply won't find a better VALUE than this for a truly MOVE-IN READY unit that has easy access to the courtyard. Building roofs recently replaced. CONVENIENT location at a LOW price! Direction: Breckenridge Lane South to right on Six Mile Lane, left into development, left at fork, park in GUEST Parking noted on parking space blocks. The Lodge is a subdivision within the city of Louisville, Kentucky. There are currently 0 Homes for Sale within The Lodge, with asking prices ranging from $0 to $0. The average list price per square foot of the available inventory in The Lodge is $0, which is the Louisville average of $157. The Average Sales price of all sold real estate in this subdivision for the past year is $54,800. Recent comparable homes have been selling for 95.18% of their asking price. Waterfront homes represent of the available The Lodge inventory. The population of Louisville, according to the 2010 Census, is 597,337. The total number of households in the zip code of The Lodge is 13,533, with an average household size for of 2.30 people. The total number of renter households within the zip code of 40218 is 6,472, which means that 52.18% of households in this zipcode are owner occupant households. 3504 Lodge Ln #129, Louisville KY 40218 is a Condo, with 1 bedrooms which is recently sold, it has 689 sqft, 0 sized lot, and No Garage,Off-Street Parking parking. A comparable Other, has bedrooms and 0 baths, it was built in and is located at and for sale by its owner at $ 0. This home is located in the city of , in zip code , this County Other, it is in the Subdivision, and Green Meadows are nearby neighborhoods.